In May, we checked out the site of an NCAA baseball game in Texas and we stick with the college theme but move to the Pacific Northwest with a look at the site of the 2018 Division 1 Outdoor Track and Field Championships, Hayward Field on the campus of the University of Oregon, for this The Pléiades 1 – SPOT 6/7 Stadium of the Month. 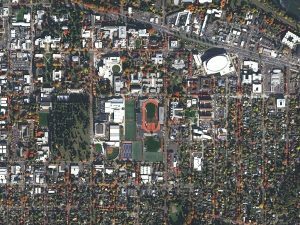 A 50-cm color image of Hayward Field in Eugene, Oregon, USA collected on December 6, 2017 by Pléiades 1B; and then a 1.5-m SPOT 7 image of the same stadium collected on October 28, 2017. These images have custom processing and color balancing applied by Apollo Mapping. PLEIADES © CNES 2018, Distribution Airbus DS. SPOT © Airbus DS 2018. Name & Its Origin: Hayward Field is named after the 44 year coach of the University of Oregon track and field team, Bill Hayward, who coached from 1904 to 1947. 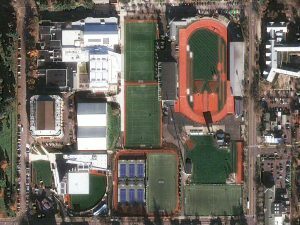 Location: Located on the southeast side of the University of Oregon’s campus in Eugene, Hayward Field is just a half mile (0.8 kilometers) from the banks of the Willamette River. The track and field stadium is some 445 feet above sea level and is about 53 miles (85 kilometers) from the Pacific Ocean. Stadium Capacity/Size, Architect & Build Date: Originally opened as a football stadium in 1919, Hayward Field added a 6-lane 440-yard long track in 1921 for just $10,000, thereby ushering in the era of track and field events. In 1970, the football team moved into Autzen Stadium meaning that Hayward Field became an exclusive venue for track and field; then in 1980, the track was converted to a 400-meter oval. There is also a two-year major renovation planned that will start during the summer of 2018 and in the end will take the seating capacity to 12,900 (from 10,500 now) with room for up to 30,000 fans. Type of Field Surface: Hayward Field features an Olympic caliber track surface installed by Beynon Sports, the BSS 2000, which is a combination of rubber and polyurethane. Key Sports Teams: The University of Oregon men’s and women’s track and field teams call Hayward Field home. Most Popular Yearly Event: After checking out multiple ticketing websites, it appears that Hayward Field is currently only used for track and field meets and championship events. Fun Factoids: (1) In 1969, Hayward Field hosted the Eugene Pop Festival where the Doors played a short set of just 4 songs to approximately 5,000 fans. (2) If you have seen the movie, Animal House, then you have also seen Hayward Field as it had a cameo in the popular John Belushi movie. (3) The first Nike shoe every made for sale was created in 1974 with a waffle iron in the basement of Hayward Field by Coach Bill Bowerman and track athlete Phil Knight. This entry was posted in The Geospatial Times and tagged Pleiades 1, Pléiades 1 Stadium of the Month, product updates, SPOT 6, SPOT 7, The Geospatial Times by Apollo Mapping. Bookmark the permalink. Is this possible to receive the image free? Hi Mohammad – we cannot offer free custom images, if you find a sample on our site you like, please feel free to use it for personal use only.